We are back home from doing five art festivals in Florida. We started out in Fort Myers, Florida at ArtFest, a new show for us. Congratulations to Tom who received an Award of Distinction at this show. We then continued to our second new show of the 2016 season, and that was ArtiGras in Jupiter, Florida. We then headed to Naples, Florida for Naples National. We flew home for eight days and Tom worked on commission pieces. We flew back to Tampa, Florida to do the Gasparilla Arts Festival. Congratulations to Tom who received an Award of Merit at this show. The weather was gorgeous at Gasparilla and art enthusiasts came out to support the arts. 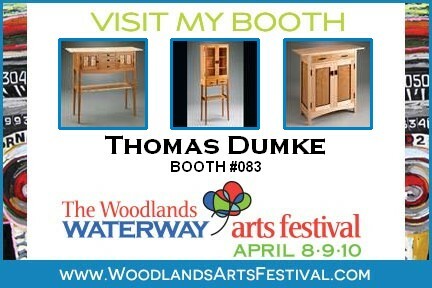 We then headed to Vero Beach to do our final Spring art festival in Florida for Under the Oaks. Congratulations to Tom who received an Award of 1st Place. We head to Texas for two shows, The Woodlands and Main Street. The Woodlands in Houston, Texas is a new show for us. Now in its 11th year, The Woodlands Waterway Arts Festival has become a showpiece for the Texas fine arts tour and is ranked among the top 10 arts venues in the country. This is a festival that appreciates its artists and art patrons. Set in a gorgeous venue along a 1.25 mile waterway and waterside park, this juried fine arts festival features 200 national and regional artists. The location 27 miles north of the greater Houston area with over 4 million residents and 1 million along the Montgomery County/North Houston corridor. We are in booth #83. Hope to see you there.